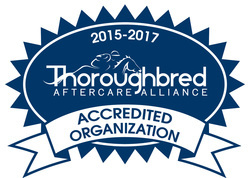 On December 9, 2013 , the Thoroughbred Aftercare Alliance announced that New Stride Thoroughbred Adoption Society, has now been granted accreditation as an aftercare facility. We are one of the two Canadian adoption societies granted this status, which was renewed in 2015 for two more years. Read about TAA's set of accreditation standards. New Stride’s volunteers work hard at retraining our Thoroughbreds and finding them the best possible new homes. Since 2002 New Stride has found homes for over 150 former Thoroughbred race horses. Thanks to our donors and volunteers, New Stride has helped these racehorses enjoy happy second careers.